What is it about a collection of machines and games that entrance so many of us? Is it the noise? 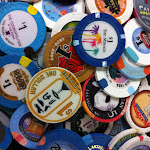 The chinging “C” notes of the slot machines, the beeps of a video poker machine and even the sound of cards being dealt. Why do we enjoy playing games that we are mathematically designed to lose at? We intensely position ourselves for minutes around the table in anticipation of the seconds after the die are cast to reveal the results of our analysis of the situation. It hardly seems like something fun to do or even worth the effort. However, like all of you, the sights and sounds do mesmerize me and honestly, I don’t really care why. I just know it feels good when I’m in its midsts. I laugh when I lose because I’m supposed. I shout when we win because we overcame one of the true absolutes in the cosmos, math…and its fun. For all the reasons a casino floor thrills us, that’s why the panorama we took at Main St Station is the Twitpicof the trip.